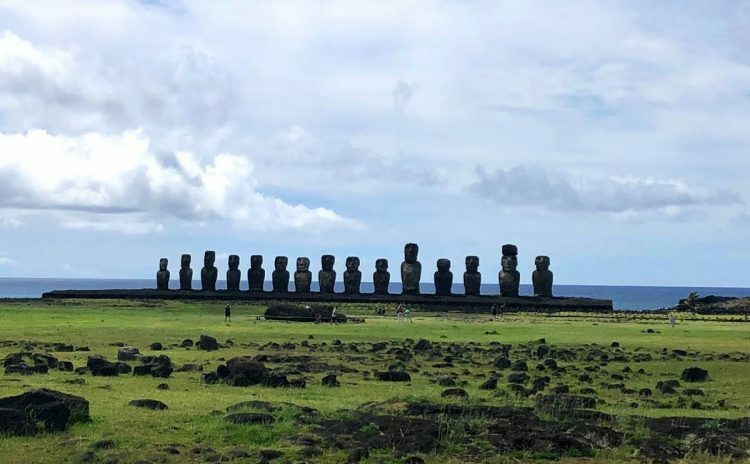 Whether you call it Easter Island, Rapa Nui (the Polynesian name) or Isla de Pascua (what the Chilean government calls it), this little speck of land in the middle of the ocean has intrigued people for centuries. One of the most remote places on the planet, Easter Island (I’ll stick with that name in this article) is an intriguing and complicated place to visit. I had wanted to visit this island since I was a child and saw the mysterious giant heads called moai on a National Geographic magazine cover. Recently, I was finally able to fulfill this dream, as well as get an eye-opener into a place that is not easily categorized or understood. Every year it seems there’s a new theory of how the Rapa Nui people got to the island, why and how the moai were built, how they were transported across the island and why they were knocked over later. Whether or not those questions are ever answered won’t change the beauty and the mystery that the island holds. Roughly 14 by 7 miles in size, just about 64 square miles in total, Easter Island is a little over 2,200 miles away from mainland Chile, which it is annexed to, and has an estimated 9,000 residents, of which about 3,000 are indigenous. There just three roads, so getting lost is pretty much impossible. 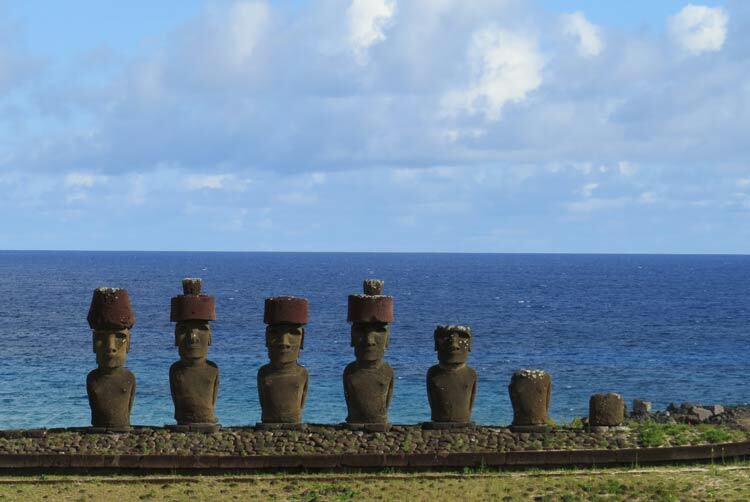 All the island’s various archaeological sites are considered part of the Rapa Nui National Park, and purchasing a ticket gives you access for 10 days. Since the island is so small, you can easily visit all the sites in a few days. Buy your park ticket at the airport when you land to save time later. 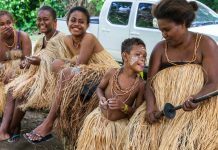 The best plan for most people is to book island tours through your hotel or a tour operator, eliminating the need for a car and having a local on hand to talk about the history of the island, the moai and the culture. On my visit, I hit all the main sights with a tour guide from my hotel (see below). He was native born and passionate about the history of the island. He freely shared how complicated the relationship to tourism, the island’s main industry, can be for many residents. Once you learn about the island’s history, it’s easily understandable. For a great introduction to the island’s past, a visit to the Museo Antropológico Padre Sebastián Englert is a must. I think it should be the first stop for every visitor so you can learn about Easter Island’s history and some of the challenges it faces, from over-tourism to climate change. Along with a comprehensive timeline, the museum is home to one of the very few female moai on the island and the replica of a coral eye found during the reconstruction of an ahu (the platforms the moai stand on) at Playa Anakena. In short, the prevailing theory of the history of Easter Island, which is a mix of oral tales and outsiders’ observations, is that King Hotu Matu’a and his family sailed here, mostly likely from Polynesia, landed on the beach at the north shore and began the population of the land. Famous Norwegian explorer Thor Heyerdahl thought that the original settlers came from South America, but it is now commonly believed that the Rapa Nui are of Polynesian descent. Once you see the traditional dances, names and some words, this seems most likely. 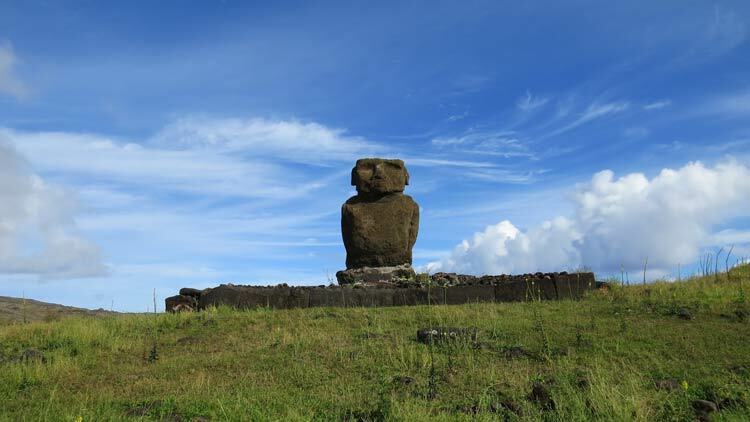 From the Rano Raraku quarry, where the statues were carved from the volcanic hill and moai in every stage of construction can be seen, to the small beach of Anakena, where several moai stand sentinel and it is said the first people to the island arrived, you will see moai practically everywhere you go. 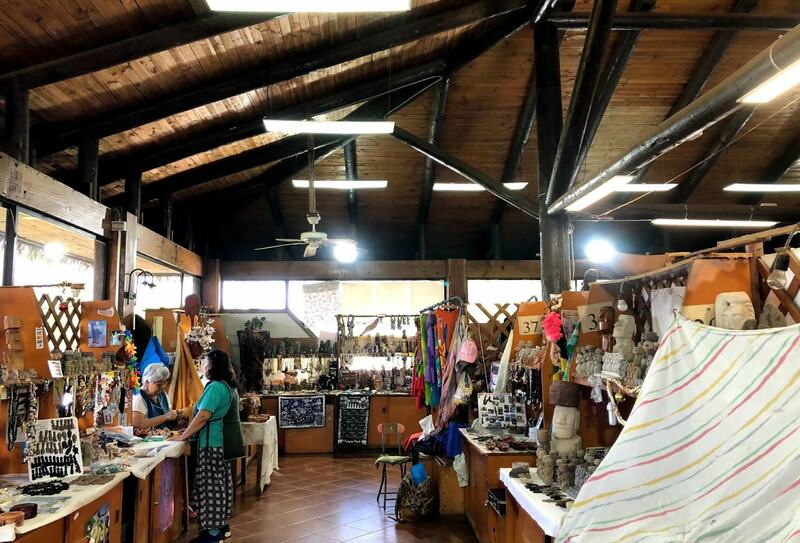 When you can tear yourself away from them, make sure to visit the town, where you’ll find lots of shops, a great artist’s market and the Iglesia Hanga Roa. 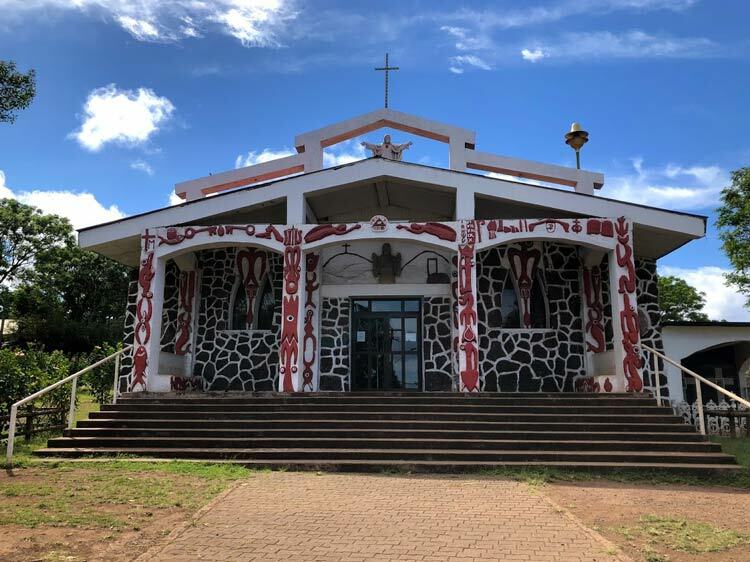 While the church is certainly Christian, the décor has a Rapa Nui flare. Did my visit to Easter Island live up to my expectations? Absolutely. It’s an intense feeling to stand in front of any one of the moai, to imagine the effort and the dedication of a people to carve and erect these giant figures for some purpose which we may never understand, on this tiny island in the middle of the ocean. It’s a humbling experience and regardless of whatever higher power you might believe in (or not), it’s spiritual in a very visceral way. I dare you to watch the sun rise over the amazing figures and not tear up in awe. 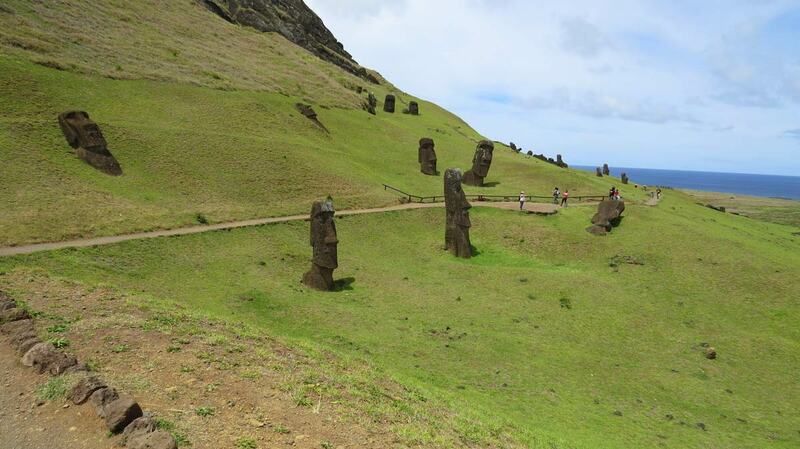 Here you’ll find 15 moai in a line on a 200-foot ahu (platform). They face a large ceremonial area where you can see petroglyphs of turtles and fish. Look at the ears of the moai, which have holes in their earlobes and might once have been filled with obsidian. 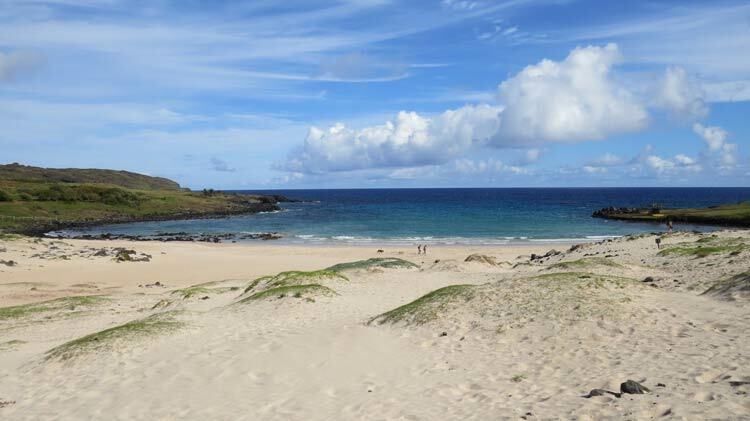 This beach is where it is all said to have started, where Hotu Matu’a landed, and now you’ll find five moai (and two mostly destroyed) standing and which are called Ahu Nau Nau. 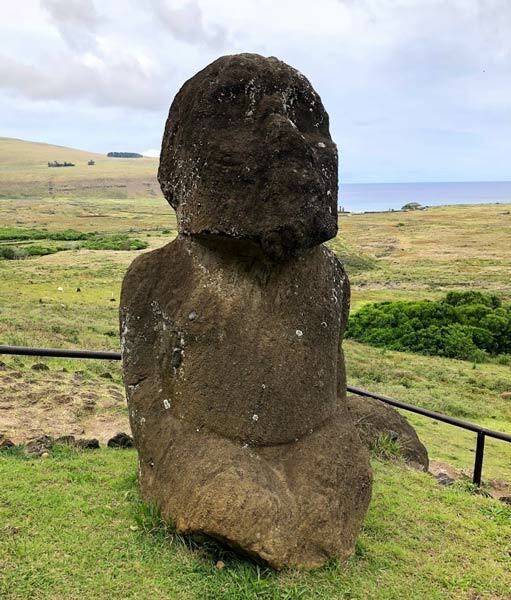 There’s also a nearby lone moai called Ahu Ature Huki, which was replaced on his ahu by Thor Heyerdahl as an experiment to test how islanders said moai were erected with just rocks and wooden poles. This large volcanic crater on the southern tip of the island is found on the backside of Orongo and is a mile across. It holds a lake nearly covered over by reeds. 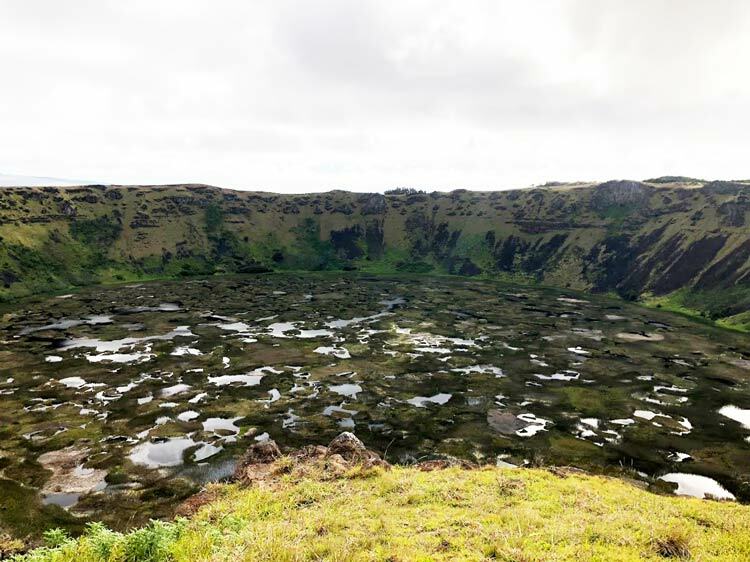 Visitors are forbidden from climbing down the sides of the crater, but you can walk around part of the edge. Views from here are stunning. This extinct volcano served as the quarry for constructing moai and gives you a small glimpse of the process, if not the how it worked. At least 400 have been counted in some stage of construction on the outer rim and inside the crater. Look especially for El Gigante, a huge moai measuring 22 meters (72 feet) and Moai Tukuturi, the only statue in a kneeling position. 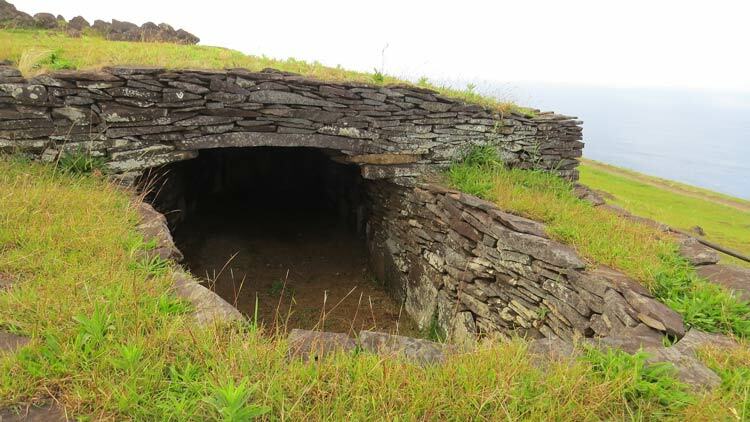 The ceremonial village of Orongo, thought to have been built in the late 1600s and used by locals until 1866, was only occupied during the ceremony honoring the god Make-Make and the base of operations for the Birdman competition. 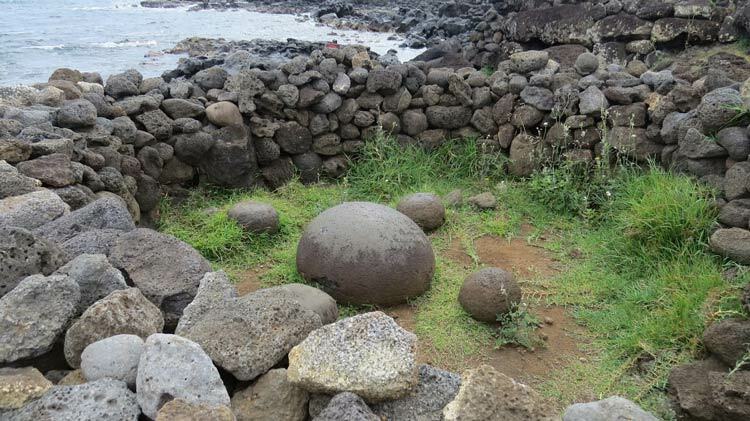 As Easter Island is often called the “navel of the world,” you should head here to see the perfectly round stone that Hotu Matu’a is said to have brought with him to the island. This site is also the location of the biggest moai ever moved and erected on the island called Paro, which was almost 10 meters tall. It was one of the last to be knocked down in the 1800s. There a few resorts, guests house and B&Bs. 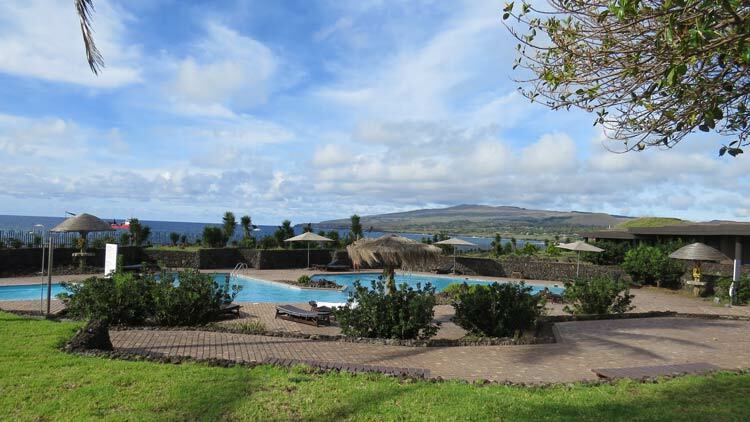 I stayed at the Hangaroa Eco Village & Spa, which is conveniently located within a five-minute walk to Hanga Roa, the island’s only town, is just minutes away from the airport by car (the resort will arrange to pick you up). 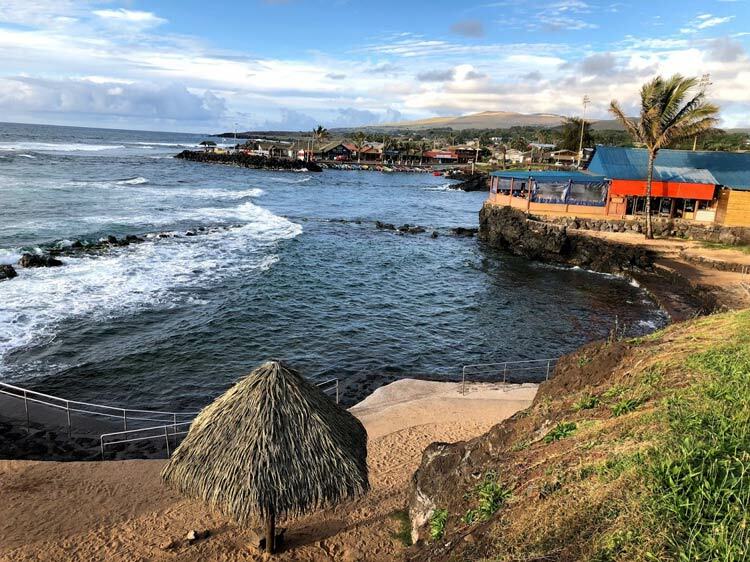 The quirky and charming resort has an unusual design, with one-story buildings featuring curved walls and grass roofs, meant to evoke traditional historic dwellings of the local Rapa Nui people. 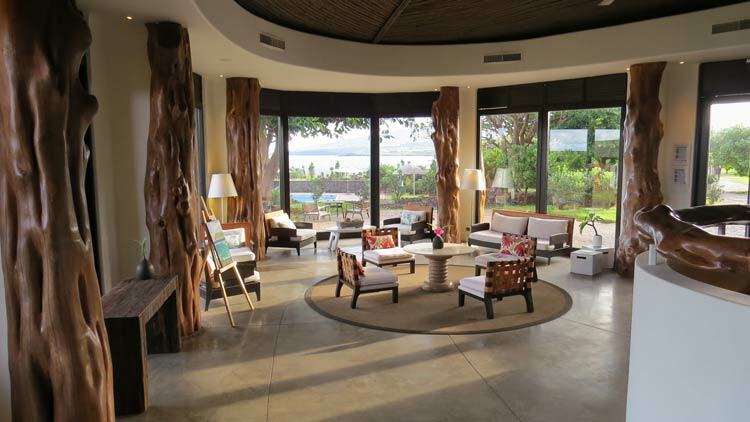 Located overlooking the Pacific Ocean, each of the enormous rooms has panoramic windows and patios. There is also an outdoor pool, spa and a playroom, which is stocked with games and toys. Guests can opt for different accommodations packages, all of which include airport transfers, a welcome flower necklace and drink, a one-time stocked mini-bar and daily breakfast. 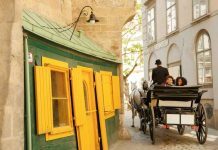 Add-ons include all three meals, plus drinks, and daily half-day or full-day excursions. The excellent excursion staff can help plan your daily adventures, which include options from hiking to snorkeling to heading out on an ATV, and of course, visiting Moai. The all-inclusive package makes your stay easy and seamless. That said, anyone considering staying here should be aware that the hotel is a bit controversial. The site has been disputed by locals as not having been purchased fairly and there are protest signs tacked to the outside of some of the fences on the property. The current owners have an agreement in place for ownership to be handed over to a local foundation before 2050. Other than the signs, guests won’t notice any other issues or be adversely impacted. 300-400 (estimated): The island is settled, often said by King Hotu Matu’a and his family. 1000-1450 (estimated): The moai statues are carved and erected. 1600s: After years of internal warfare, moai construction ends and the Birdman cult is born. 1722: On April 5 (Easter Sunday), Dutch navigator Jacob Roggeveen arrives and names the island for his landing date. 1774: British explorer James Cook visits Easter Island and records that some statues had fallen over or were knocked down. 1888: Annexed by Chile. 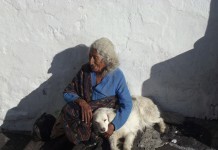 Locals are confined to the settlement of Hanga Roa. The rest of the island is rented to the Williamson-Balfour Company as a sheep farm until 1953. 1947: Norwegian explorer Thor Heyerdahl, who believed that the original settlers came from South America, sails from Peru in a balsa-wood boat called the Kon-Tiki in 1947, to prove that it was possible. 1965: The airport is constructed. 1966: Chile declares Easter Island a province and islanders become Chilean citizens. 1995: UNESCO names Easter Island a World Heritage Site. Flying? LATAM Airlines is the only airline that flies to the island, flying direct a few times a week from Santiago, Chile, and once a week from Papeete, Tahiti; either route takes less than six hours. Pack good walking shoes! Some of the sites involve quite a bit of walking, so sensible shoes are essential. Hiking poles can also be quite handy for steep inclines. Buy your park tickets at the airport to save time. If not, you’ll have to go into town. Visit the moai at dawn AND at dusk for magical sunrises and sunsets. On your excursions, bring water and a snack, as some of the sites have no services. Author Bio: Kim Foley MacKinnon is a Boston-based freelance food and travel writer who loves to travel the globe but is equally happy to come home and write about all her favorite places in New England. Writing credits include the Boston Globe, Food Network, Forbes Travel, Cruise Critic, Global Traveler, USA Today, and her most recent book, 100 Things to Do in Boston Before You Die. Follow Kim on her adventures on Twitter and Instagram @escapewithkim.